Something a little different today - not quilting » What's Under the Needle? This week I stepped away from quilting but of course, not from my sewing machine. My daughter is due to have her second baby and asked me to make some dribble bibs and gauzes so that's what I did - both very quick and easy. All I needed to do was run the overlocker around the gauzes - I made about a dozen or so, ranging in different sizes. The dribble bibs took a little longer. 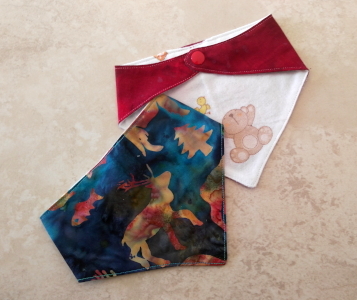 I found the pattern online - search dribble bib pattern and literally hundreds of free patterns come up. The best part was selecting the fabrics. Here's two I made. 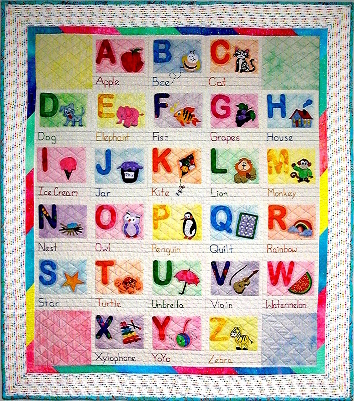 I'm wondering if I should make an alphabet banner for the baby room. When my grandson was born, I made alphabet letters for his name and they were so much fun. These letters come from the ABC's pattern and I can just imagine the entire alphabet strung up around the room for baby to look at.